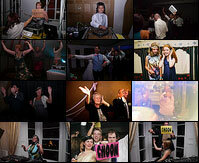 Wedding entertainment packages from Stick It On for a unique, alternative reception party. With so many different people to cater for, it can sometimes be really challenging choosing between different wedding entertainment packages. Stick It On provides a unique evening format which will excite and engage your guests and, most importantly, deliver a great night. We understand the importance of ensuring a memorable service to seamlessly fit into the plans for the day. We’ll discuss your wedding schedule to gain a better understanding on how your day will run from start to finish. Then, we’ll ascertain the best time to start the Stick It On fun. We deliver a first-class service, but don’t take our word for it. Please visit our testimonials page and see for yourself. If you’re still unsure as to how Stick It On works, please refer to our main weddings page here for full details. We appreciate that there are many factors and costs to take into consideration when planning for your wedding day. Therefore, we have three options on offer which vary according to different budgets. This is our most popular package and offers a comprehensive service without the need for any add-ons, but we are always happy to cater for those special requirements. This is our package that covers everything bar the kitchen sink and is for those couples who really want to splash out 0n an all singing and, definitely, all dancing evening. This package delivers a Stick It On party via two unique cost-spreading options that make your wedding entertainment more affordable. Download our pictorial step-by-step guide on how we organise a Stick It On wedding party.